FIRST MONDAYS – SPECIAL FREE CLASS OPPORTUNITIES! 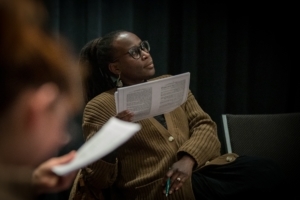 Calling all local playwrights: DCPA Education is thrilled to offer a new resource to hear your material read out loud. Bring 10 minutes of a work- in -progress, that you’d like to hear out loud, providing an opportunity for you to hear it off of the page to help you develop it further. This cold reading series is a tip of the hat to Naked Angels’ “Tuesdays at 9”, a program that has helped playwrights develop their work for years in NYC and LA. This series if free to all artists and the public, and plays will be received to be read on a first come first served basis each evening. Playwrights with material please arrive at 6:30pm to queue your work. Please highlight any stage directions to be read. DCPA Education hosts the reading of a play every other month, as an opportunity for actors and enthusiasts to read, listen and enjoy. Each play will be selected by facilitator Kelly McAllister, and interested readers for the play will be “cast” at the beginning of the session that evening on a first come, first served basis. Scripts will be provided to readers on the evening of the event. We hope you will join us to read, or listen and enjoy!